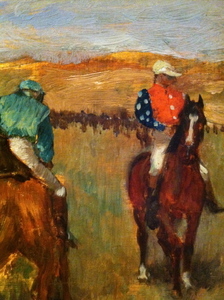 Many of Degas’ paintings and drawings of racehorses have titles that name the same moment. 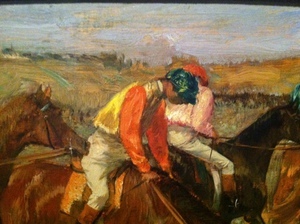 The one at the Clark Museum is called “Before the Race.” Degas, we are often told, wanted to capture the feeling of motion in painting. The moments before a horserace are astonishingly dense with motion, not the wild free motion of the race, but the expectation of it. I think people who love races love the combination – before and during – the anticipatory pausing steps, a taut potential that then gallops free. Great paintings work continually along the tense edge between stillness and motion, and painting seems well-suited to giving the hesitating about-to-be-motion that comes before. 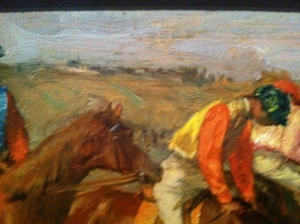 It was only in looking at the pictures afterward that I noticed that I had been repeatedly drawn to what I can now see is the fulcrum of the painting: the horse’s head almost awkwardly outstretched, the red and yellow jockey pulled forward in his saddle. The way our family saw “Before the Race” is twice related to this observation of Valéry’s. At the age of two, the world is motion, wild and free, with pauses, such as the one we take before this picture. And in this little interpolated pause, I hurriedly take a few photographs that will allow me to decipher what was inside the continuous impression my eye took. Before I saw my photographs, I knew that the painting conveyed to me a sense of excitement at once elegant and awkward, but I would not have been able to point to instances. 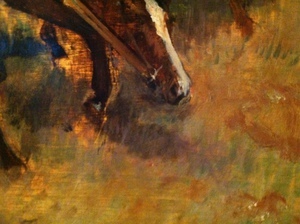 Afterward it seemed important that the first time I photographed the horse’s head I left it in isolation, and the second time I included the beautiful patch of lavender paint to the right of the horse’s muzzle, which shows that the horse is reaching toward. 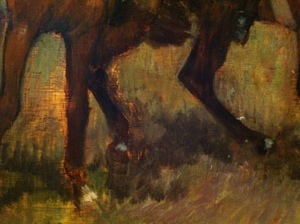 In that seven seconds, and, more importantly, in looking at the negative space among the horses’ legs, which gave me the sense of the ground – the ground of the picture, and the fundamentals of this world – I got hold of something about the relation between the stretching horse and his universe, and when I photographed the horse's head again I framed the shot to include the clues Degas had left. 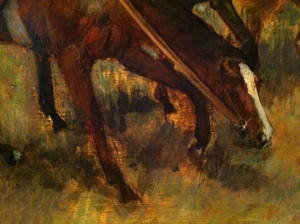 Between the horse’s nose and the patch of purple is lure and distance to be overcome, something, nostrils quivering, to reach toward and something that will receive the hooves in motion. The Clark Museum's youtube video of "Before the Race"